Sue Halpern is the author of seven books of fiction and nonfiction, most recently A Dog Walks into a Nursing Home. Her writing has appeared in The New Yorker, New York Times Magazine, New York Review of Books, Rolling Stone, and Condé Nast Traveler. 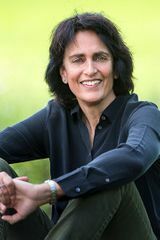 She lives in Vermont with her husband, the writer and environmental activist Bill McKibben, and is a scholar-in-residence at Middlebury College.